A visit today to Sensible Audio's Lito Gelano's place in Dasma Village allowed me to have a much awaited listening session with the 4-way front loaded 104db horn speakers that has twin isobaric woofers per speaker, according to the technical specs. 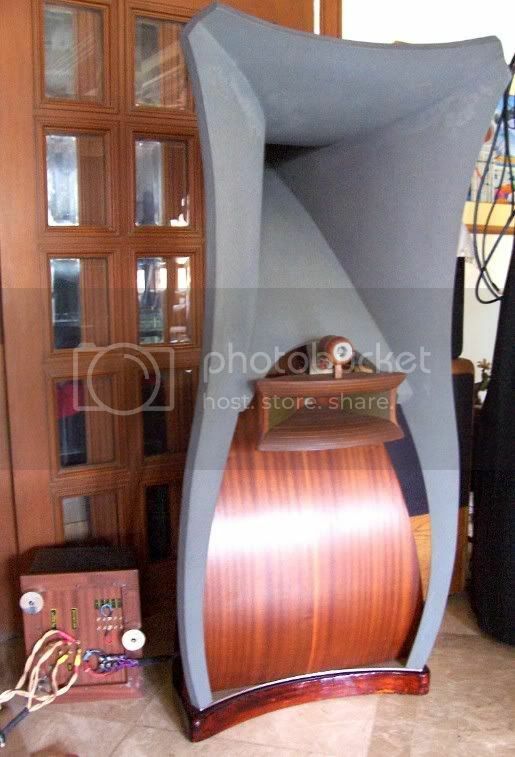 In the mid 90s when these speakers first arrived at the Listening Room in Megamall, it was described as the 'giant blue tooth', from afar it resembles just that, a tooth. It is massive, as one can imagine, and is described as the 'love it or hate it looks' in terms of aesthetics. It's quite a unique design, especially in terms of shape. The 'mammoths' were driven by the new ARC HD220 Hybirds, with the SP 11 as the pre-amp. Needless to say, the sound was HUGE, projecting life-size imaging qualities that would be a treat to 'horn' fans. Let me see....From top to bottom, on the left side: Power supply for the SP11 pre-amp, LS 26 pre-amp, CD-7 CD player, SP 11 main pre-amp, I forgot what was on the bottom. Right side, top to bottom: HD 220 hybrid amp, 2 mono blocks of the M-300, in front of it a D-125 amp with black faceplate....and oh, flanking it in both sides are the Celestion SL700 loudspeakers. Those flat speaker cables are by Nordost. Wow what a set up? Those horns looks like a giant tooth! How much is Senor Lito selling that? handyboy wrote: Wow what a set up? Those horns looks like a giant tooth! How much is Senor Lito selling that? I didn't ask....It would not fit my room. Kasya yan! Isa sa likod, isa sa bubong! the question is kaya ba ng bulsa? It look like d eurythmie is from late Mang Johnny. kenckn wrote: It look like d eurythmie is from late Mang Johnny. Yes, who in turn got it from the Listening Room. 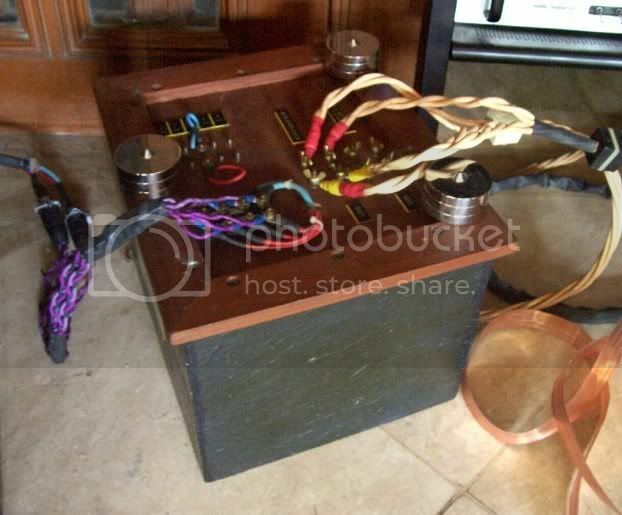 I believe Jadis of France made this to mate with their SET lines of 845 and 300B amps. My uncle says that it is for keeps, unless he otherwise changes his mind. Heard this baby about 3 weeks ago, and it's just great. Location: In your Imagination ! Le_Stat wrote: My uncle says that it is for keeps, unless he otherwise changes his mind. Heard this baby about 3 weeks ago, and it's just great. yes, he told me before he really liked it for himself to keep. and it fits well in his large living room too. Great pics Monsieur Jadis. The textile coating of the speakers is gathering mold, anyone knows how to conserve them? Its true these speakers are from the Mang Johnny collection and I feel lucky to have bought them as they were already reserved when I first saw them at the Balikbayan showroom. Sir Raffy gratiously withdrew in my favor. I first saw these at JC's Forbes house a few years back and he was selling it then for 650k. When I suggested that tube amps be used instead of Krells, he realized their beauty and changed his mind. To JC's credit, he did a wonderful and professional restoration since these were in bad shape when he got them from JR. I really loved the weird shape and the great sound. For now its not for sale, maybe later it will be. lovesaudio wrote: Great pics Monsieur Jadis. The textile coating of the speakers is gathering mold, anyone knows how to conserve them? Looks like a big flower for me, very exotic. Wild and prehistoric I like it. Have you tried cleaning it with damp foam in baking soda mix with water? It's an all around cleaner. Hope this helps. Perhaps my all time favorite speaker in terms of looks, although I haven't really heard it. Should be very special! Congrats, lovesaudio! Sassy! Very nice equipments you have there! I am not sure if I am asking the correct person but what happened to the Magnepan 2.7? Or is it anonther member's set up....I am not sure anymore. amandarae wrote: Sassy! Very nice equipments you have there! I am the one with the Magnepan 2.7. 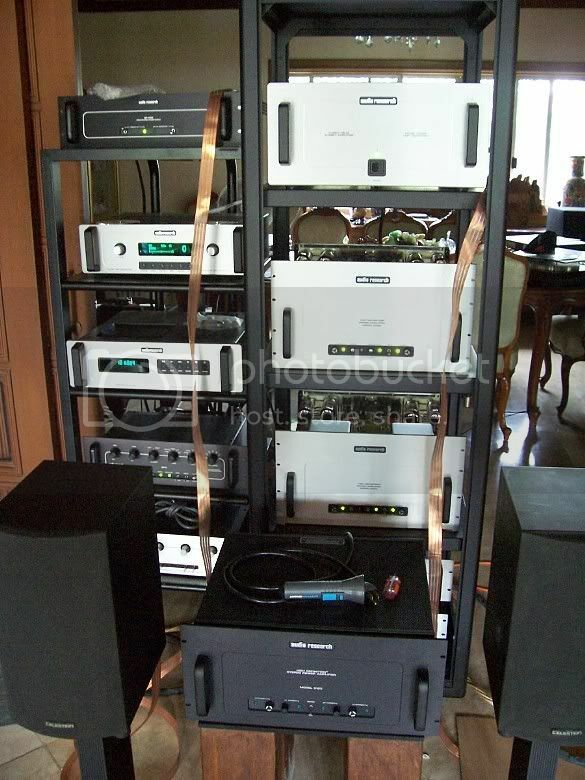 Lovesaudio owns these Jadis Eurythmies. 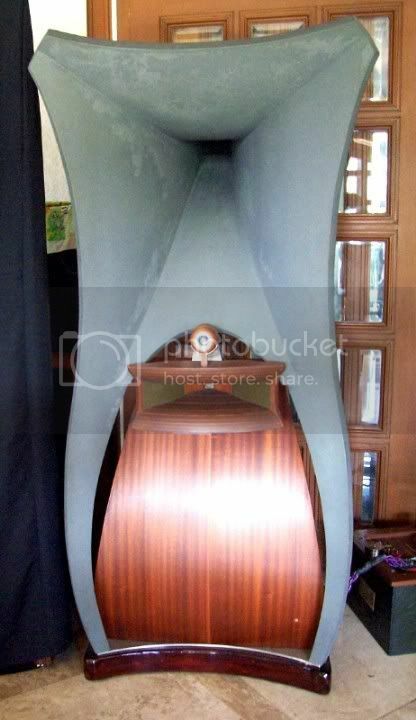 The Jadis Speakers, well, one of them, cannot even fit the door of my listening room. So that's where you were bitten by the Big Blue Tooth, aka Eurythmie. Too bad when it was brought in first by JR in The Listening Room we were not able to hear them driven by the Jadis SE845 or SE300B. 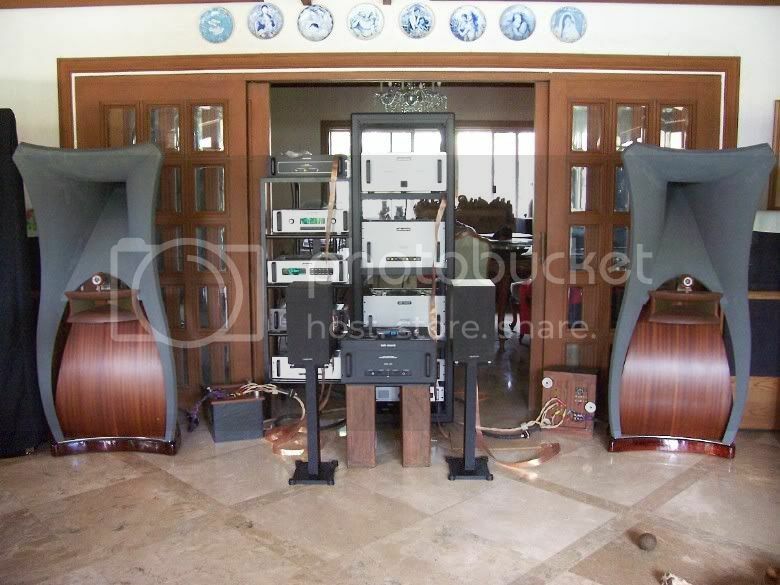 One of these Jadis SE amps is in Binondo, driving a pair of Ensemble speakers. I have heard this combination and sure enough it sounded really good. A SET set up done right I must say.